What's being done for prisoners with mental health issues in NI? 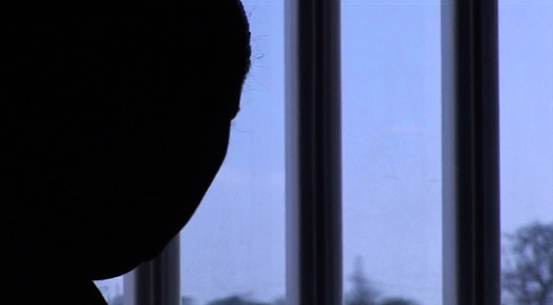 IT’S been identified time and again as the biggest problem afflicting the prison population here, but mental health issues are still barely registering within the system, an investigation by The Detail has established. Figures released to us show that more people than ever before are being transferred out of prison for mental health treatment but crucial information about the nature of those illnesses – and the possible ramifications for the wider prison population – is not collated, we have learnt. And while the spend on healthcare in general within the prison system has increased over the past three years, numerous enquiries on our part have failed to establish a clear picture of what the money is being spent on: how this reflects prisoners’ healthcare needs or the treatment available to them – and this includes the field of mental health. Prisoners’ psychiatric conditions, addictions and personality disorders have been a common thread in critical reports into prison life and individual incidents in jails here in recent years, including suicides. Any information we requested from the Northern Ireland Prison Service on health care were directed to the South Eastern Health and Social Care Trust who have had responsibility for prison healthcare since April 1 2008. A breakdown of the budget for all prison healthcare reveals a total expenditure of over £22m during the last three years. The spend on “pharmacy drugs” has continued to rise across Maghaberry, Magilligan and Hydebank Wood prison since 2009. The cost of pharmacy drugs in Maghaberry increased by almost £250,000 from 2009-2012. Click here to read a more detailed account on the healthcare expenditure. The trust told us that within a prison population of between 1,700 and 1,800 here, there were a total of 57 prisoners transferred to psychiatric hospitals under the Northern Ireland Mental Health Order between March 2010 and December 2012 – the order being used for prisoners with “severe and enduring mental health problems”. The trust’s position contradicts that of prison regimes in GB and flies in the face of recommendations of the Prison Review Team’s healthcare report two years ago which said that data collected on any such transfers should include detail on what types of mental disorders were being diagnosed, what level of secure services were required, how long transfers took, the length of stay for treatment, and arrangements for return to prison. :: Reports by the Prisoner Ombudsman, Pauline McCabe, into a succession of suicides in prisons here have raised bigger questions about the ability of the prison system to get to grips with managing the emotional and psychological problems of the prisoners in its care. :: in September 2011 the Health Minister, Edwin Poots MLA, told the Assembly that “90% of prisoners have a diagnosable mental health problem, substance misuse problem, or both”. The Northern Ireland Association for the Care and Resettlement of Offenders (NIACRO), has carried out some research into the potential impact of the figures quoted by Mr Poots and calculated that: given an approximate total of 5,890 receptions to custody over a 12 month period; and the average population of people in prison of 1,465, it equates to around 5,301 people per year, or 1,319 on any given day, who require some form of treatment and support. The Association says this clearly demonstrates the necessity for the Prison Service and South Eastern Trust to work together to “identify need appropriately and plan their service delivery in accordance with the requirements of people in custody”. In March 2011, as part of the Prison Review Team’s overall investigation into the conditions of detention, management and oversight of all prisons here, healthcare expert Susan Russell was brought on board to produce a report on the standard of prison healthcare in Northern Ireland. The report outlined that it was essential to collect data about mental health need and in particular information about the number of prisoners who would meet the criteria for transfer under the Northern Ireland Mental Health Order. At the time of publication there was no data available around the number of Mental Health Orders used within the Northern Ireland Prison Service (NIPS). Of the 57 transfers, 14 were in 2010, 18 took place in 2011, with a further 25 transfers in 2012. The figures show that the most common age for transfer was between 18-30 years. The vast majority were male prisoners from Maghaberry prison to Shannon Clinic in South Belfast. Shannon clinic is Northern Ireland’s regional psychiatric unit located at Knockbracken Healthcare Park in South Belfast. 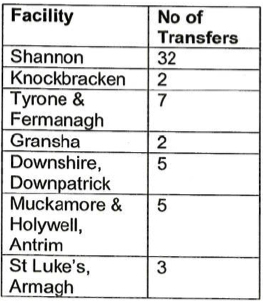 There were no transfers made from Magilligan prison. However, in the previous review report Russell notes, that it is likely that individuals from Magilligan would have been transferred to Maghaberry for assessment and transfer. As part of our FOI request we asked for further details including information on the types of mental disorders diagnosed and how long transfers were taking. In a statement to The Detail about the prisoner transfers to psychiatric hospitals, the Chief Executive of NIACRO, Olwen Lyner, said: "The fact that data about the number of people in prison who meet the criteria for transfer to a treatment facility was not routinely collected points to a number of flaws in a system which is failing to identify peoples’ needs, let alone respond to them. Personality disorder is not currently included in the Northern Ireland Mental Health Order, although it is being considered for inclusion as part of the 2014 review. She said it was likely that the Mental Health Order figures were only the “tip of the iceberg” but said it was important that they are kept in context. She said: "On the one hand I think it’s really dreadful that you’ve got people who are so ill that they can’t be provided with appropriate care in prison and I’m sure in each of the 57 cases there’ll be a unique story whereby their families and friends will also be deeply affected. We’re talking about people who have been failed by the system. “However in another sense it’s also encouraging that these individuals are now getting the right treatment in a community healthcare setting and are no longer in the inappropriate circumstances of a prison." As previously reported by The Detail, the Prisoner Ombudsman published a report into the death in custody of Frances McKeown (23) last November . Mrs McKeown was psychologically fragile, had a lengthy history of mental illness stretching back before her imprisonment and had threatened suicide many times. She took her own life in Hydebank in May 2011 last year. She said: ”With Frances McKeown it was clear that she had a long history of mental health issues and I think that should have been taken into consideration when she was being sentenced and picked up on sooner when she was in prison. “I take the point that the prison service are having to deal with people who should never have been walking through their door in the first place. Having said that when the prisoner walks through the door, the prison service has a duty of care towards them. They become their responsibility." The report into the death of Frances McKeown found that she had not been seen by the prison psychiatrist for six months and the authorities also failed to request her previous GP and medical records. Dr Moore said: “As far as I can see in terms of the most recent death in custody reports, the problem has been much less about picking up on the issues and more about what action was taken as a result of this awareness. The Ombudsman’s investigation into Frances McKeown’s death concluded that despite an awareness of her mental health history – she was subjected to long periods in her cell because of repeated prison lock downs. Mrs McKeown’s case is the most recent in a number of death in custody reports published by the Prisoner Ombudsman in recent years that have raised issues around prisoner’s mental health provisions. 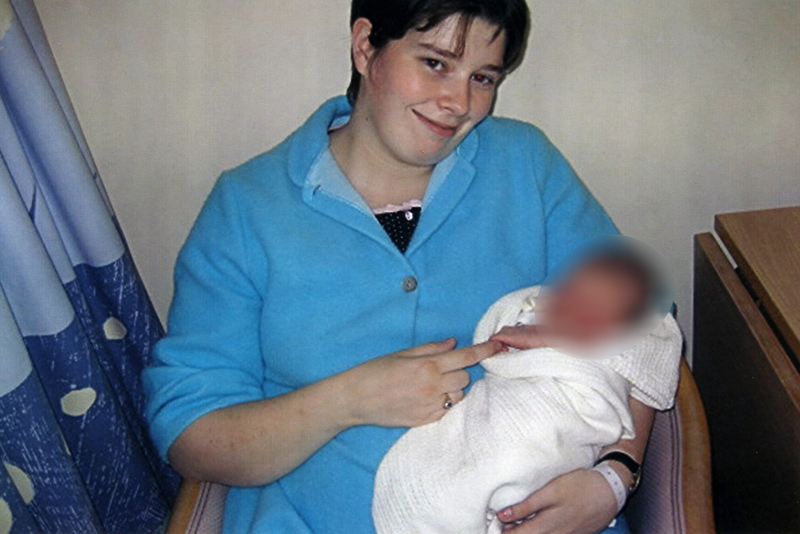 In April 2004 34 year-old west Belfast mother Roseanne Irvine died in Maghaberry Prison while on suicide watch. Ms Irvine, who had a history of depression, alcoholism and self-harm, was unable to see a prison doctor the day before she took her own life because he was “too busy” in the male part of the jail. In July 2008, 34 year-old inmate Colin Bell also took his own life while on suicide watch in Maghaberry. In 2009 an investigation into his death criticised prison staff and recommended the governor and deputy governor be subjected to a disciplinary investigation after it emerged that some night custody officers had slept or watched television while Bell, who also had a history of self-harming, took his own life, after several attempts, with a makeshift ligature. 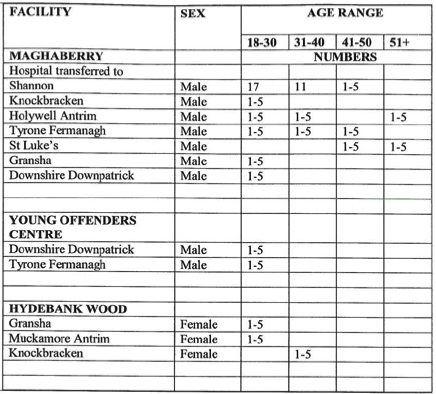 In May 2011 at Hydebank’s Young Offender’s Centre, Samuel Carson (19) took his own life a number of hours before Frances McKeown. The Ombudsman report found that he died by suicide in a neighbouring block after a lengthy campaign of bullying. Despite these warnings Samuel hadn’t been seen by mental health authorities in the seven months before his death. Dr Moore says that report after report continues to create a clear picture that prison is an unsuitable environment for anyone with mental health problems. Dr Moore believes the issue opens bigger questions for the criminal justice system here as a whole. She said: “In my view if people are ill enough to fall under mental health legislation to the point where they’re transferred out of an institution, I would say certainly they should never have been in prison in the first place."